Description: Children with an interest in golf with love this set! The set includes a green square putting tee platform that rests on the ground. The platform has a blue putting tee in the center and an indented area to hold extra golf balls. The set includes a separate green base with a small ramp and target hole at the top of the ramp to practice putting. 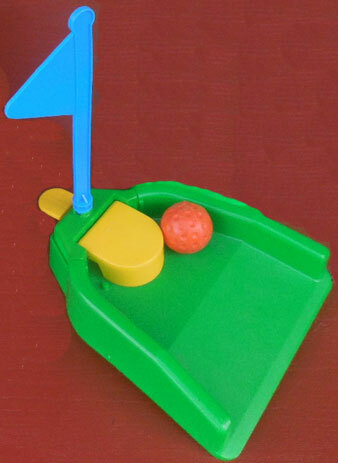 The hole has a flag behind it, and when the ball goes in to the hole, a yellow cap flops down over the ball. A release on the back of the base ejects the ball. The set includes two golf clubs, a driver and a putter, and 6 hollow plastic golf balls. This set is safe to use indoors. Designed for children ages 3 to 6 years old. FPT11062 - Square green putting tee platform with a blue putting tee in the center and an indented area to hold extra golf balls. 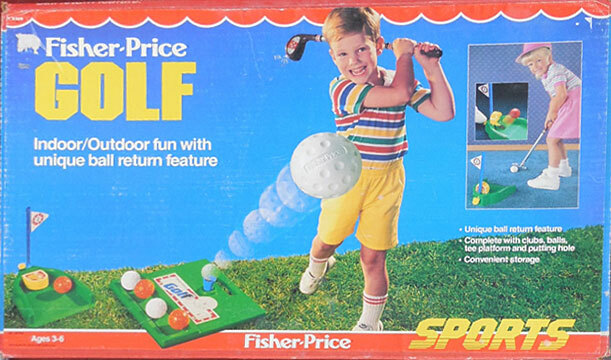 The center of the platform has a white litho with "Fisher-Price Golf". The platform has a built-in carry-handle for portability. There is a white mesh bag on the back to store the accessories when playtime is over. FPT11063 - Green base ramp with a target hole at the top of the ramp. When children put the ball into the target hole a yellow cap flops down over the ball. A release on the back of the base ejects the ball. FPT11064 - Blue hard plastic flag and flag pole that fits onto the back of the target ramp. The flag has a white litho on both sides with a red ring with white stars in the center and a blue "1" in the center of the ring. FPT11065 - Driver - Silver with a brown rounded driver end and a brown handle. FPT11066 - Putter - Silver with a silver flat driver end and a brown handle. FPT11069 - (BOX ONLY) This set was sold in a 23-3/8" long, 14-3/4" high, 5-1/4" deep box. FPT11070 - (COMPLETE SET) - Complete set in original box.